This week things aligned for some exceptionally good ski mountaineering in the Tetons. A nice spring storm had come in warm, bonding well to the old snow surfaces, and finishing cold and dry. Perfect for skiing and avalanche stability. 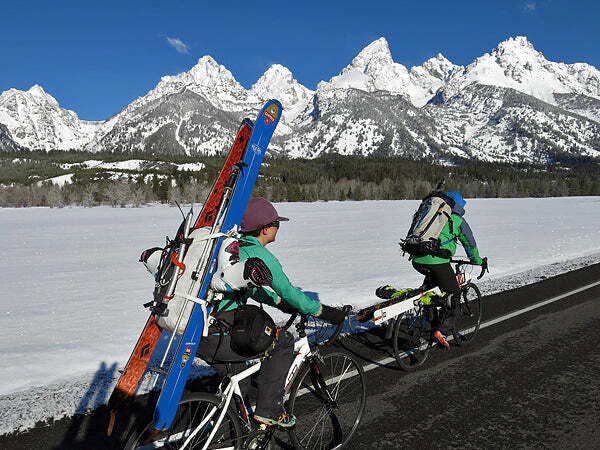 Our week included some excellent adventures with bicycle access in Grand Teton National Park (on a road closed to auto traffic), and was punctuated by a ski descent of the highly coveted Grand Teton. Possibly the most iconic mountain in the lower 48, and a challenging ski mountaineering objective by any route. As with many things in life, timing is one of the more important aspects of a project like this. Two days of letting the new snow settle, and we were off at 11:30pm. Climbing through the night, our Hyperlite Mountain Gear Ice and Porter packs were carefully packed (two thin ropes, ice climbing gear, some rock pro, a stove, and lot’s of photo and video equipment, ect.). The plan being, to ski the Ford/ Stettner route on the Grand, capture some amazing video content, and then link up the Middle and South Tetons, for a Teton trifecta. Above all though, we hoped to do it in good style. The weather ended up turning a bit too warm for the link-up, but skiing phenomenal untracked/ bottomless powder down the upper east face, and Ford Couloir was an experience we won’t soon forget. The post Skiing the Grand appeared first on Hyperlite Mountain Gear Blog.